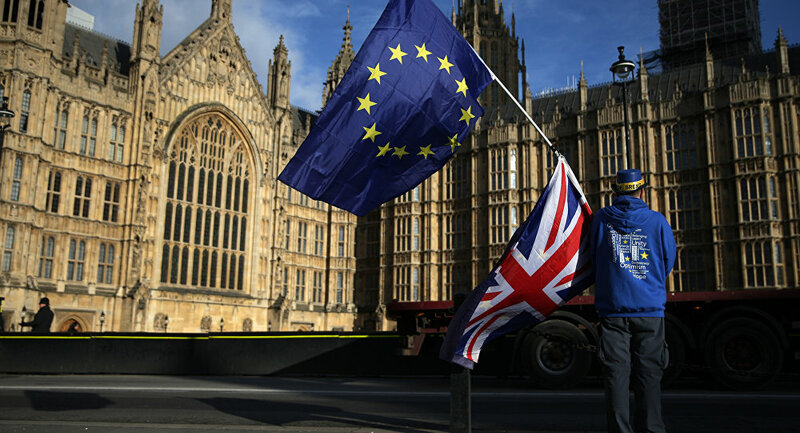 MOSCOW (Sputnik) - The yet unknown financial costs of the withdrawal from the European Union limit the United Kingdom's ability to respond to the resulting economic shocks, the UK Parliament's Public Accounts Committee said in a report on Friday. "There is little wiggle room in the UK’s public finances. Government accepts public sector debt is too high yet it expects to increase the amount it will borrow by some £55 billion [$78.4 billion] over the next few years. Taken with the continued uncertainty over the financial impact of Brexit and rising levels of personal debt, I am concerned about the Government’s capacity to respond to future shocks to the economy," the Committee's chair, Meg Hillier, said a comment to the report. After the UK voted in favor of the country's leaving the bloc June 23, 2016, the invoked Article 50 of the Lisbon Treaty triggered great concerns over the economic future of the country. However, the latest study carried out by the British think-tank UK in a Changing Europe says that the country's succession from the EU will have far less impact on the financial services industry than had been forecasted. As the analysis explains, financial services are not at particular risk from Brexit because they are intensively sold within the domestic UK economy and the financial services industry as a whole is highly globalized. The ongoing Brexit negotiations between London and Brussels, which started on June 19, are expected to conclude by the end of March 2019, after which the two sides will likely adjust to new regulations during a two-year transition period.